As Sandy Recovery Begins, Romney Draws Scrutiny for Campaign Vow to Gut FEMA, Emergency Relief | Democracy Now! reporter for Mother Jones magazine. assistant director of climate research and analysis at the Union of Concerned Scientists. AMY GOODMAN: This is Democracy Now!, democracynoworg, The War and Peace Report. I’m Amy Goodman. A million people remain without power across 15 states following Hurricane Sandy, one of the most devastating storms to ever hit the eastern United States. The storm’s death toll in the United States is 55, expected to rise. The storm also killed at least 69 people in the Caribbean, including 51 in Haiti. In New York state, 90 percent of Long Island remains in the dark, as does Lower Manhattan and other parts of the city. As the East Coast begins the difficult task of rebuilding from Superstorm Sandy, the largest Atlantic tropical storm on record, we now turn to the role of emergency responders and federal relief. Cleanup of the disaster begins in the final days before the presidential election. During a Republican primary debate, Republican nominee Mitt Romney was asked about the Federal Emergency Management Agency. In the wake of Superstorm Sandy’s widespread destruction across much of the Eastern Seaboard, reporters on Tuesday did try to ask Mitt Romney several times if he would deal—how he would deal with FEMA if he were elected. He refused to respond. We’re going to go right now to Tim Murphy of Mother Jones magazine. He’s in Washington, D.C.
Tim, can you talk about what Mitt Romney’s stance on FEMA is and, overall, on the issue of climate change and these hurricanes? TIM MURPHY: Yeah. Well, Mitt Romney’s issue—Mitt Romney’s stance on emergency management is still kind of ambiguous, partly because he won’t tell us. Back in last summer of 2011 during the Republican primary, he was asked at a debate, point blank, what he would do for FEMA, the department of emergency management. And Romney sort of hedged a little bit, and then he said, “Well, I would delegate more power to the states, and I would privatize some functions.” And John King, the CNN moderator, followed up, and Romney said, “Yeah, yeah, I would definitely, you know, downsize it a little bit, and, you know, some of it really isn’t the federal government’s responsibility.” He is now trying to sort of backtrack that—backtrack from that, mainly by not talking about it. You know, he refused to answer questions, as you mentioned, yesterday. His campaign was pressed for comment, and they said that he would not cut funding. But, you know, Romney himself is sort of staying mum. AMY GOODMAN: Can you talk about the attempts by reporters to ask him questions? TIM MURPHY: Yeah. He was asked yesterday at a campaign event in Iowa a couple of times by a couple of different reporters—sorry, at a campaign event in Ohio. And the campaign event was ostensibly to collect resources for folks in New Jersey and the East Coast who are still, you know, suffering the after effects of Hurricane Sandy. And he was asked, you know, whether he would abolish FEMA or cut it or cut funding from it, and he really just doesn’t want to talk about it right now. But you can just look at his budget to see what Mitt Romney would do for FEMA. He proposes capping non—capping federal spending at 20 percent of GDP by 2016. And he would—the consequence of that is he would cut non-defense, non-entitlement spending by something like 40 percent. Now, he doesn’t say where any of these cuts come from. The only cuts that he specifically outlined are Planned Parenthood and PBS. But for something as big as 40 percent of the federal budget, you’re talking about a massive cut to FEMA, almost certainly. His running mate, Paul Ryan, has, you know, sponsored a budget plan that would likewise cut FEMA by a significant percentage, almost certainly, although he, like Romney, doesn’t specifically say what he would cut. AMY GOODMAN: Can you talk about the effects of cuts on relief and FEMA, and also Republican governors, who have long called for the cutting of the budget, calling for federal aid when in crisis? TIM MURPHY: Yeah, and the sort of—the way that, you know, Romney and Ryan view emergency management is that it’s not something that should necessarily exist by itself; it should only be funded to the extent that you can cut a corresponding amount of money from somewhere else. So that was the context of Romney’s remarks originally, is that Republicans had blocked appropriations for disaster relief in the aftermath of the Joplin tornadoes, unless the federal government—unless, you know, the Obama administration would cut funding from, say, food stamps or education or something like that. You know, that is, it’s not something that you should just dig into the piggy bank to fund. And that’s what Romney and Ryan would contribute to. And this isn’t anything particularly new from conservatives. You know, during the Republican primary, you had Ron Paul talking about eliminating FEMA altogether. You have, you know, sort of the Glenn Beck, Michele Bachmann types warning that FEMA is up to some sort of nefarious, you know, internment camp program. And then you have the Heritage Foundation types who believe that, you know, federal emergency management sort of creates a culture of dependency. AMY GOODMAN: I wanted to bring Brenda back into the conversation. Brenda, you’re with the United—the Union of Concerned Scientists. In this whole issue, overall, the lack of discussion of the connection between climate change and this—and this superstorm that has taken place, and those that say you cannot attribute one storm to climate change, there is no proof? BRENDA EKWURZEL: Yeah, I want to point out that a nightmare combination really occurred to make the storm surge particularly dangerous for Lower Manhattan. And that’s a simultaneous high tide, a full moon, and sea-level rise. Now the first two are entirely natural, but the latter, sea-level rise, is strongly influenced by climate change. And while there are many natural factors, climate change is adding power to the storm and so on. And with regard to the presidential candidates, city planners and folks in Florida are grappling with sea-level rise, and they’re trying to look at their climate action plan. And many have signed—over a hundred have signed a letter to the presidential candidates asking them, imploring them, to help them deal with climate change, and especially, in particular, the issue of sea-level rise and coastal infrastructure. AMY GOODMAN: I mean, it’s interesting now, Mitt Romney’s famous comment in his Republican convention speech, when he said President Obama is concerned about the seas rising; I’m concerned about families, helping families. But President Obama and Mitt Romney, neither raised the issue of climate change, nor did their questioners, in the three presidential debates. BRENDA EKWURZEL: Yeah. In South Florida, Southeast Florida, there are recurrent flooding that’s happening just on these—a supermoon high tide flooded the Key West Airport. And we’ve seen pictures of this. And coastal residents down there are dealing with it every day. 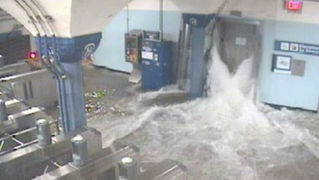 And now New York City is dealing with a storm surge that is riding on top of this historic hurricane. If it had happened a century ago, we had eight inches less global sea level. So now we’ve had eight inches more of global sea-level rise largely due to melting ice sheets and the warming oceans, expanding the ocean and adding sea-level rise. So, a storm today is not like a storm of yesteryear. And really, city planners really are the first responders of climate change, because they’re trying to protect residents and take steps for the long-term planning of climate change and sea-level rise. And it’s the storm surges, the extreme events, that we have to prepare for, and they’re getting higher and higher with each passing year. AMY GOODMAN: And, Tim Murphy, final comments in your research for Mother Jones around what happens in times like these, which we can only expect to get more frequent. TIM MURPHY: Yeah, well, I mean, you know, this is the type of thing—we’ve had 14 natural disasters of $1 billion or more over the last year, and that’s only going to happen more and more. And this is the type of thing that, you know, Halliburton can’t do, the state of New Jersey can’t do. You really need the federal government and an effective emergency management agency to coordinate response from the top down to be able to, you know, coordinate resources and that kind of thing. This is—this is, you know, the kind of situation where big government really matters, and that represents sort of a big difference in approach between President Obama and Governor Romney. AMY GOODMAN: Well, I want to thank you both very much for being with us, Tim Murphy of Mother Jones magazine—we’ll link to your piece—and Brenda Ekwurzel of the Union of Concerned Scientists. This is Democracy Now!, democracynoworg, The War and Peace Report . I’ll be speaking tonight in St. Louis at Left Bank Books Downtown at 7:00 p.m. Then it’s on to Kansas City, Missouri, tomorrow night; I’ll be speaking at IBEW Local 124 at 7:00 p.m. And then on Friday night it’s Houston, Texas, at the Emerson Unitarian Universalist Church at 7:00.